Hawaii Native Status: Introduced. This naturalized ornamental garden plant is native to New Caledonia and Vanuatu. Description: The plants are monoecious with both male and female flowers on the same plant. The small, greenish, petal-less flowers emerge from the leaf axils and are inconspicuous below the colorful, flower petal-like leaves. 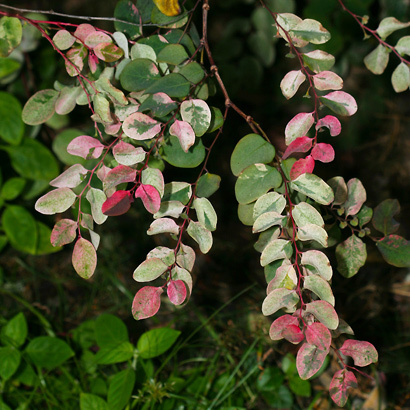 The leaves are hairless, elliptic to egg-shaped, smooth-edged, up to 1 inch (2.5 cm) long, and variegated with green, pink, pinkish red, and white. The leaves near the stem tips are the most brightly colored, while those near the center of the plant are mostly green. The branchlets are reddish and zigzagged. The plants spread aggressively and profusely by root suckers. 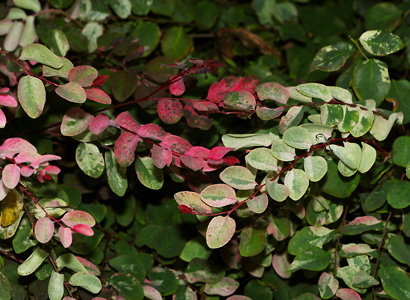 Because of its beautiful foliage, Snowbush is commonly cultivated as a colorful hedge plant here in Hawaii, and due to its aggressive suckering habits, it now grows wild in areas near where it was formerly planted.